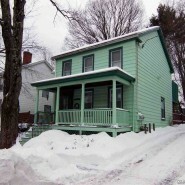 Beth recently downsized from a 1,200 square foot, two bedroom apartment (with big closets) in Kingston, NY to a 900 square foot home (with one closet and a sleeping loft). When she's not plotting how to get rid of her stuff, she works as a consultant in data management. She lives in the Adirondacks with her husband and young daughter.